EW-7326Ig is a compact size wireless PCI adapter which provides a simple and easy way to add or upgrade wireless connectivity to your desktop computer. 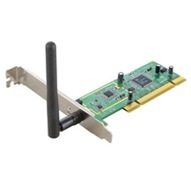 This wireless 11b/g PCI adapter supports high data rate up to 54Mbps and compatible with wireless 802.11b/g device. You can plug it into your computer's PCI slot and enjoy incredible high-speed wireless network access. Edimax EW-7326Ig Wireless PCI Adapter Quick Install Guide and User Manual. Thanks for some driver free here in your website.. i need it, Thanks you so ,much.